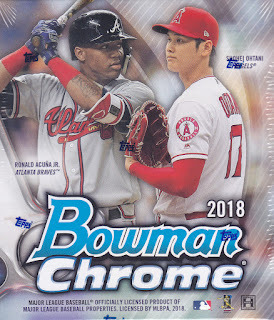 Home » 2018 Bowman , 2018 Bowman Chrome , Autographs , Review , Ronald Acuña Jr. , Shohei Ohtani » 2018 Bowman Chrome Baseball Review - Do two star crossed rookies have what it takes to push 2018 Bowman Chrome to the top? 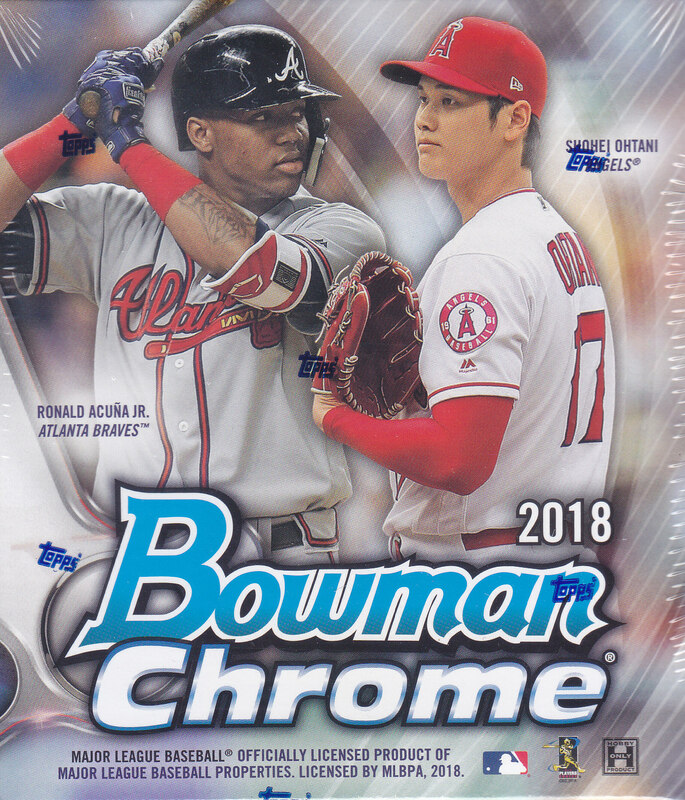 2018 Bowman Chrome Baseball Review - Do two star crossed rookies have what it takes to push 2018 Bowman Chrome to the top? With the regular season wrapped up, fans are looking towards the 2018 Bowman Chrome Baseball release for their favorite stars and Rookie of the Year candidates on their chromium-embossed cards. The boxes feature the ROY frontrunners Ronald Acuña Jr. and Shohei Ohtani, drawing in collectors with the hope of scoring limited edition autographs and parallels of the cream of 2018’s rookie class. Each master box contains two six-pack mini-boxes, guaranteeing that at least two autographs and one shimmer refractor parallel will be uncovered in the 12-pack journey. Those who indulge in 2018 Bowman Chrome will also find themselves about a quarter of the way towards the completion of the 100-card base and prospect sets. Bowman entices collectors with their autograph selection, offering an opportunity to snag signatures of top prospects such as Estevan Florial, Luis Urias, and Enyel De Los Santos. Rookie autographs include the aforementioned Acuña Jr. and Ohtani, as well as Gleyber Torres. For those with a lucky hand, even Mike Trout, Kris Bryant, and Russell Wilson (yes, the Pro Bowl quarterback) are among the extensive list of signers for this year’s edition. 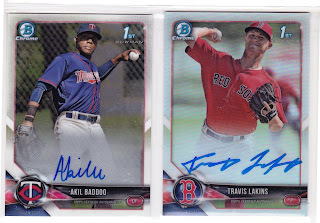 The box provided for this review drew two prospect autographs. One of Minnesota Twins outfield prospect Akil Baddoo, and a refractor autograph of Boston Red Sox pitcher Travis Lakins, numbered to 499. While this box did not yield an autograph nor a base card of the two cover boys (Acuña Jr. and Ohtani), it did turn out some attractive colored limited edition parallels that are sure to capture collector’s eyes. This master box a green parallel numbered to 99 of Chicago Cubs prospect Aramis Ademan, a purple shimmer refractor of Pavin Smith, and a base refractor of Cardinals mainstay Paul DeJong. Bowman keeps consumers on their toes with a variety of insert sets, highlighting different facets of minor league stardom. Arizona Fall League stars have their own set, while the Peaks of Potential set features the next wave of top prospects. Another nifty touch by Bowman for 2018 Chrome is the return of the Sterling inserts, which were a favorite in the earlier 2018 Bowman release. As the postseason is in full bloom, 2018 Bowman Chrome gently reminds collectors that while the big league stars are writing the history books right in front of us, there is another talent pipeline ready to create their own record setting paths. You can get on that next train to MLB stardom right now by digging into your own box of 2018 Bowman Chrome Baseball.